8 Benefits of Using Custom Waste Receptacles and Recycling Receptacles - Glaro Inc.
Should I consider custom waste receptacles, recycling receptacles, and trash cans? For those who have decided that a generic recycling or waste receptacle just won’t do, customized waste receptacles, trash cans and recycling receptacles for indoor or outdoor use from reputable receptacles manufacturers are always strong options to consider. 5. Help identify that the waste receptacle is the property of a particular company or entity, which helps increase security and decreases the chances that someone will take your receptacles and reuse them elsewhere (on purpose or accidentally). 7. Increase your ability to customize the overall look of your receptacles by, in Glaro’s case, mixing and matching over 31 finishes, creating a monotone or dual tone look depending on how you finish the waste receptacle covers vs. the waste receptacle bodies. 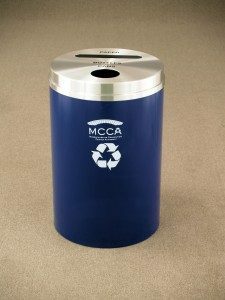 Examples of customization include custom silk screened messages, custom wording and custom logos on receptacles; customized finish combinations that create a unique look; and, customized waste receptacle designs that fit a particular specification. Whether you are a dealer researching custom waste receptacles or an end user, customized Glaro Inc. products offer a level of versatility and personalization that is rare in the receptacle manufacturing industry. If you are in need of receptacles for Hotels, Casinos, Restaurants, Cruise Ships, Institutions, Government Buildings, Building Lobbies, Museums, Airports, Rest Stops, The Hospitality Industry or any public place and customization is something you would like to learn more about, we encourage you to contact us. We are a happy to talk you through the options available to you or just answer some of your questions. Call 1-888-234-1050. Dual Purpose Powder Coat Finished Custom Recycling Waste Receptacle by Glaro Inc.